Brush up on the basics of trench safety so that everyone is kept safe on the job. There are lots of safety concerns on a construction site, and one of the biggest concerns excavation and trenching. Excavation is defined by OSHA as any man-made cut, trench, or depression in the surface of the earth that has been made by earth removal. Trench is more specifically defined as an underground excavation that is deeper than it is wide and is no wider than 15 feet. These characteristics are what makes trenching so much more dangerous than the average excavation because there is a risk of falls, falling loads, and cave-ins. The risk of cave-ins is what makes trenching the greatest risk of accident-related fatalities, with trench collapse resulting in dozens of fatalities each year. Read on for everything you need to know about trenches and trench safety. Do not enter trenches that don’t have a necessary safety system. Some examples include systems that slope the walls back at an angle, systems that shore up the walls with supports, or systems that shield the workers with a box. Trenches that are more than 5 feet deep require a safety system unless the trench walls are solid rock, and trenches more than 20 feet deep require that the safety system is designed by a professional engineer. OSHA requires that trenches be inspected daily and after any conditions change by a competent person. This is because the safety of the trench and the appropriateness of the safety system are based on factors that can change, like water content of the soil. So after it rains, or after the trench is deepened, it will need to be inspected again before anyone enters it. A competent person is someone who is skilled at identifying potential and existing safety issues and concerns and who is authorized to take corrective measures when those issues are discovered. In addition to the above safety precautions, any trench that is more than four feet deep must have safe and convenient ways to enter and exit it. This could mean that there are ladders, steps, or even sloped ramps for workers to use. These means of access and egress must be within 25 feet of all workers in the trench. This means that if your trench is 50 feet long, you must have at least a means of egress at each end. 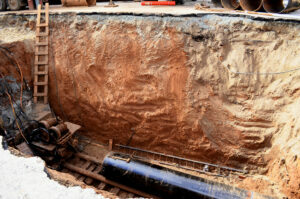 Some trench safety is the same as with any other excavation. Keep heavy equipment away from the edges and keep surcharge loads at least 2 feet from the edge. Do not work under raised loads. Finally, make sure that you know where underground utilities are located and test often for fumes and gasses. This entry was posted on Thursday, April 4th, 2019	at 1:55 pm	and is filed under Safety Tips	. You can follow any responses to this entry through the RSS 2.0	feed. Both comments and pings are currently closed.